Description: A pair of North America map GE's lead CN train M-340. Description: CN Train 392 passes the Board of Water and Light power plant at Washington street in Lansing, heading east. Description: A colorful consist at New Brighton! Five units, CN,UP,GTW(CN),WC,WC(CN). Not too bad! Title: CN 396 making a set-off. Description: CN 396 with CN 2519 - CN 5639 is pulling down the main to clear the crossovers into the yard so they can make a 30 car set-off of empty flyash hoppers. Description: Here the CN Taylor Tunr sits waiting for the 11:30AM crew. Title: Still making some smoke! Description: The trailing C44-9 on the Taylor Turn was still making some pretty heavy smoke out of Taylor. Description: Around noon the Taylor Turn gets moving out of Taylor. 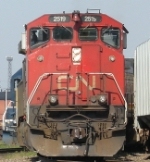 Description: CN 2519 and westbound Train 393 passing the depot at Durand. Description: CN 2519 and westbound Train 393 lean into the curve at Oak Street. Description: CN 2519 leads a power trio southbound enroute to MacMillan Yard.